I'm not a big fan of Coachella as I find most of the fashion and hairstyles lazy and outdated boho style. Setting new trends rather than repeating old ones Solange wore an Alice & Olivia lemon print dress on day 3 of the festival. She also twisted a side-split skirt from J Crew $1300 to create a mid split thigh flashing vibe. Her 2010 look was quirky and cool. The Mia Moretti trouser suit was a dream. She has sharp taste in shoes too. Super glam at the Angel Ball 2012. 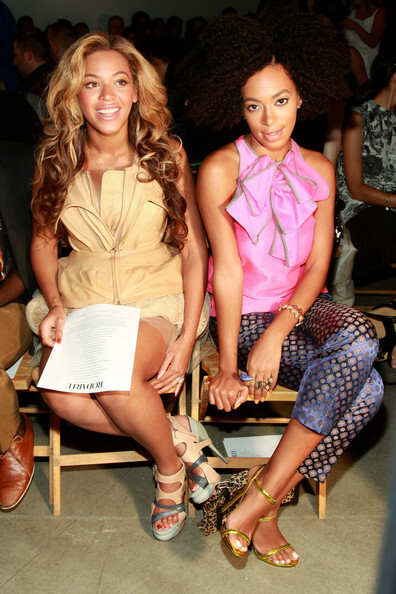 Check her style evolution with Beyonce. Rika Magazine shoot. Brilliant boots. Her True EP continues to gain praise and sales. Check it out! I love her style so much.